I've known from the moment I started working on the original B5678 tunic that I would be lengthening the pattern and making it a dress. It has that easy wear, cool look that I'm trying to achieve in this new phase of my life. That's what I started out doing...but I ended up with this topper instead. The most important thing about this topper is how I used the stripes...which meant some creative cutting to get the fabric to work the way I saw it in my minds' eye. Thank goodness I had four yards of fabric and no qualms about using it in special cutting layouts. This resulted in some big and unusual scraps leftover. The fabric was laid on the crossgrain so that the stripes would be vertical instead of horizontal. 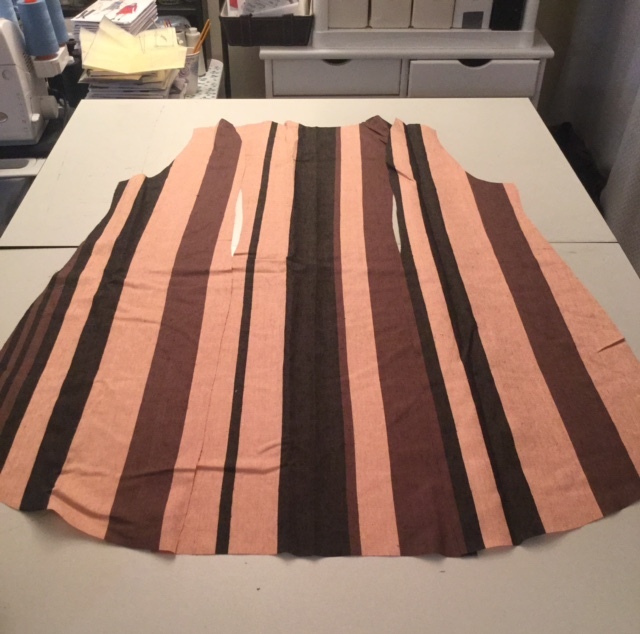 Then the pattern pieces were cut out using a single layout to take best advantage of the stripes since they have an irregular pattern. I also cut fashion fabric on the bias as the underside to the collar stand, the lap for the sleeve openings and the cuffs mainly because I didn't want the faux leather next to my skin. As much as I love sewing and wearing faux leather, I've found it's kinda clammy next to my skin. I decided to add a lining to the topper but I couldn't decide whether to underline it or to let the lining hang free. Ultimately I went with a free hanging lining that I attached to the topper at the neckline and in the button band. I also used plastic tortoise shell buttons with a gold center down the front of the garment. 13 buttons and buttonholes for the topper front and covered snaps were invisibly added to the topper's cuffs. Instead of hemming the topper I added a faux leather bias binding to the hemline from the collection. It seemed like the stripes needed to be contained and the bias binding was the perfect ending to the stripes. However, after finishing it, I wasn't sure I liked it. Partially because I just couldn't see myself wearing it. If I can't see that, the garment will just sit in the closet. Gradually over the week, I began to "see" outfits in my head...only thing none of those outfits was a dress...I saw it more as a topper. So that's how I will wear it. The wind so graciously provided an interior shot of the lining! I enjoyed making this topper. It had some interesting components to it and it required me to think outside the box...perfect to remind me that I actually can sew! *LOL* Hey there's been some days/weeks lately when I haven't felt like I could...I know you can agree that you've been there, done that too! Oh, one more thing - almost everything for this garment came from the collection. The only thing I purchased were the covered snaps (35 cents each for 5) from Pacific Trimmings last week. My new job is located in the heart of the garment district, no I don't work for a fashion house or design firm, and I now have easy access to all of the stores. There's a "Throwback Thursday" up next on the blog! So thrilled to have found it when I was cleaning out the closet cause I can sure use it now. I love how you've managed the stripes on this. And yes, the hem band finishes them so nicely. I can certainly see how this is going to be a great transitional item (season to season, style to style) for you. And if you do let it go, someone will be very lucky to have it, so it's all good. It is a thing of beauty. Gorgeous. Exactly what is a 'topper'? I always thought a topper was a hat.....a top hat??? It's like a jacket. It goes on top of everything. I won't wash this - it will go to the dry cleaners. This turned into a great topper. I love how you're successfully changing up your wardrobe to suit your new job and new body. You look great! Love the topper, Carolyn, you look super-cool in it! This works really well as a topper. The faux leather adds an interesting detail and the vertical stripes are very flattering. Great outfit! I like this dress as a topper!! Lovely fabric. Thanks for posting about bias fabric for backing to faux leather; I agree that faux leather can feel clammy and sticky next to the skin. I will use this idea in the future. I can tell the photos don't do that fabric justice.. Very pretty and you can definitely wear it many things. Very nice! Wow! Your creativity inspires me! Love the use of the leather trims and the idea of a topper for this in-between weather!! Very nice!!! A great look for autumn days that don't require wearing a heavier coat. Love your topper! What a great transitions piece for fall. The leather really kicks it up a notch. Another beautiful finish! Thanks for sharing your creative process. This turned out to be a fantastic topper. With the browns and black it is neutral, but the leather gives it pizzazz! I know I have said it before, but I am LOVING your casual style. Lovely work, as always. And you look fabulous! This is so stylish . I love all the ways you thought outside the box - very inspiring ! One of my favorite Carolyn-made garments so far, well done! You could be on the cover of Vogue with that beauty of a topper...stripes win hands down! Inspiration wearing it as a topper. It tones down the stripes which might be overwhelming as a dress. Very nice! Oh my...your topper is beautiful! I too work not far from the garment district. It's great to go out at lunchtime and peruse the fabric and trim stores. I may run into you one day! Beautiful and a wonderful idea for me to copy. thanks so much. Long toppers are in. So you are styling with this one. Of course you always are. Nice job. This looks fantastic on you! So different than some of your other looks but still very you! Great job!